Last week, an emergency call was made to Suffolk Owl Sanctuary by a local resident because a fox was wreaking havoc in her garden! The appearance of the fox in itself was not unusual, as the homeowner encouraged wildlife of all sorts into the natural environment that she had deliberately created on her land. What WAS unusual,however, was the distress the fox’s presence was causing other creatures in the garden - specifically, a family of Little Owls which had taken up residence in a hollow tree. Little owls are by nature feisty creatures and will not shy away from an altercation with a predator but by the time the homeowner had responded to a commotion in the vicinity of the tree, the fox had already despatched the two adult owls who had been attempting to defend four youngsters they were raising. When our nature-lover found the four baby owlets exposed by the fox’s attempts to dig them out. Fearing that she might already be too late to save what was left of the owl family, she carefully removed the youngsters from danger and brought them in to the raptor hospital at the Suffolk Owl Sanctuary. 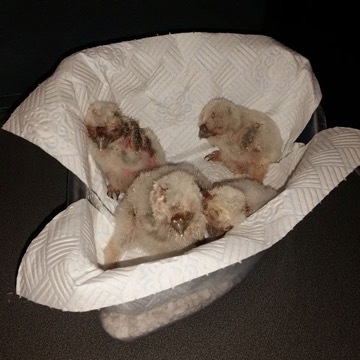 After a thorough examination, all four owlets were found to be shocked but sound, with only one having sustained an injury to the back of the neck from the fox’s claws. The quartet were settled into an intensive care incubator to warm up and recover from their ordeal and after some quiet recuperation time, their appetites were back with a vengeance! The quadruplets continued to thrive thanks to 2 hourly feeds and plenty of TLC from the falconry team and were soon out of intensive care. At this point our colleague Maz stepped in and has taken the owlets home, where she was able to start giving them the continuous attention they will need until they have fledged properly and are ready for release - watch this space for further details. The size of the diminutive little creatures is emphasised as they nestle in a small dish in preparation for being moved. The one at the back was clawed by the fox, but we believe it stands a good chance of recuperating if cared for.